Who was stupid enough to say it had been a quiet worlds so far…… (Row360 Tuesday). If you missed the chaos that was the second half of Wednesday, after an exciting but uncontroversial morning session (more about that lower down), all hell broke loose early in the afternoon as the cross-head wind decided to completely muck up everyone’s plans. Particularly those of the lightweight men’s doubles, which seems particularly unfair when the long-term future of their event is being mulled over with frowns by the IOC (as one Tweeter rightly pointed out). The trouble started straight away in the first LM2x quarterfinal, when Austria (fourth in the opening heat on Monday) beat Italy (heat winners). Spain won the second, having come through the rep, while heat-winners Canada came fifth. And the Monday heats had been a very easy qualification (four per race going through) so were not a reliably good measure of speed. (Bear with us, this is complicated). ….while long-time umpire David Biddulph turned sofa-pundit calculated that there had been an average 30.3 second advantage for lane 6 over lane 1, and an average 17.8 second advantage for lane 5 over lane 2, even including Switzerland in 5 who had caught a crab mid-race. NB: It won’t have helped that quite a few teams had already been muttering about lanes 5 and 6 having the advantage, during the first few days of racing. 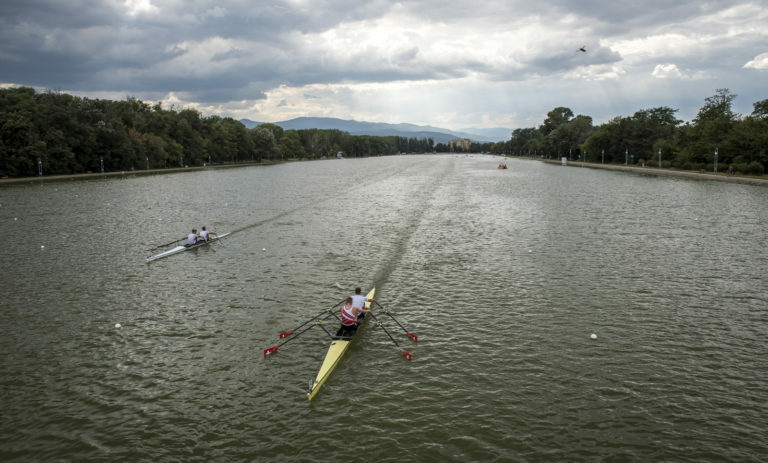 This often happens at an international regatta and may bear out the frequent claim that being next to the warm-up lane (0 here) is undesirable, but the mutterings became a positive crescendo on Wednesday. Out on the course, just after the fourth QF came down, racing was first suspended for 20 minutes in order to allow the lanes to be moved around, then suspended indefinitely and finally cancelled entirely for the day with only a brief reason given. But at the team manager’s meeting all became clear. A packed room listened in silence as FISA’s Colleen Orsmond read out a formal statement confirming that a) the FISA Fairness Commission had ruled the conditions for the LM2x races as unfair; b) the Executive Committee accepted this judgement of unfairness; but c) the Executive Committee had decided that the results of the races would stand, largely because they were very concerned about the precedent for re-rows it would set if they did otherwise. For a few moments there was a complete hush, and then several team managers shook their heads to each other. 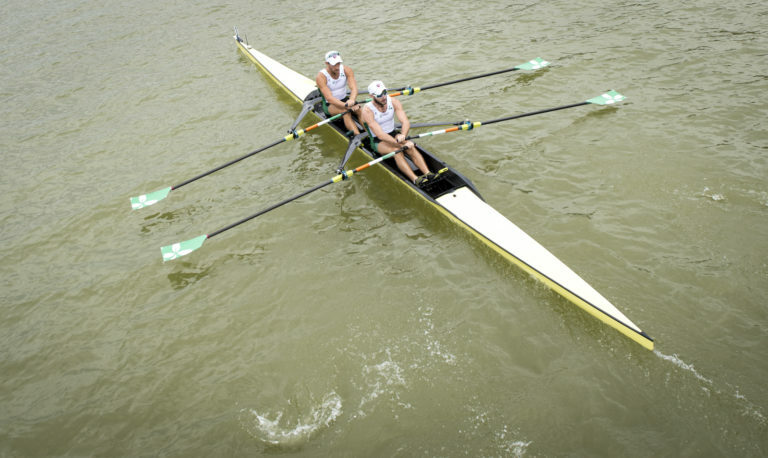 Disagreement is usually pretty courteous in rowing circles and this was no exception. Nobody shouted, nobody even raised their voice at all, but the tension was cuttable. 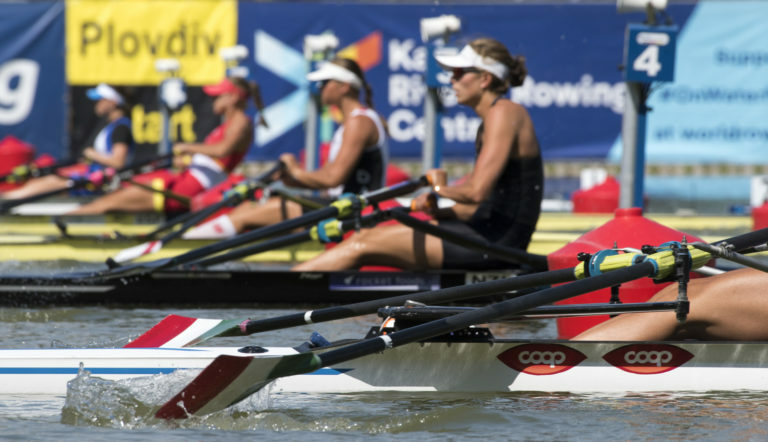 Four federations had appealed the results of these quarterfinals and one of them will have been Canada, with LM2x heat winners on Monday who languished to fifth in the QF. After coming fourth in two world cup regattas, they can now finish no higher than 13th in the world and their funding may well be cut. Another concerned sports director was Germany’s Mario Woldt, whose LM2x went several seconds faster than Britain on Monday but lost to them – and lost A/B qualification – in the quarterfinals. “Each situation should be viewed as individual,” he said, clearly supporting a re-row this time. However it was Sir Steve Redgrave, now listed under China in the FISA database since he’s become high performance director for the land of dragons, who exposed the biggest problem of the day. As he explained, a message from the Fairness Commission on the team manager WhatsApp group, telling them that racing was to be suspended from race 113, had arrived three minutes before the last LM2x race (112) had started. The Fairness Commission, which can reallocate lanes or suspend racing, had already drawn its conclusions before that last quarterfinal began. And possibly by mistake that knowledge is now out in public. Smith had one comment to make which may point to a future change. “The Fairness Commission has an inability to react very quickly. We accept that weakness and will look at the situation.” He wondered whether having a fairness chief, who can unilaterally suspend racing instantly, would work. But it’s too late to make that kind of change this week. And it’s noticeable that the race data (who rated what where on the course) for the four LM2x quarterfinals has not yet been put online….. In practical terms the cancelled races (M1x and M2x quarterfinals and M2- reps) are being run early on Thursday morning, and the men’s pairs semi-finals will be postponed to Friday morning. No changes to the A-final time lest TV times be mucked up. And that’s that, though no doubt it will not stop discussion of the rights and wrongs of the decisions taken. Photo Conditions were far more pleasant for earlier races during the morning session on Wednesday. 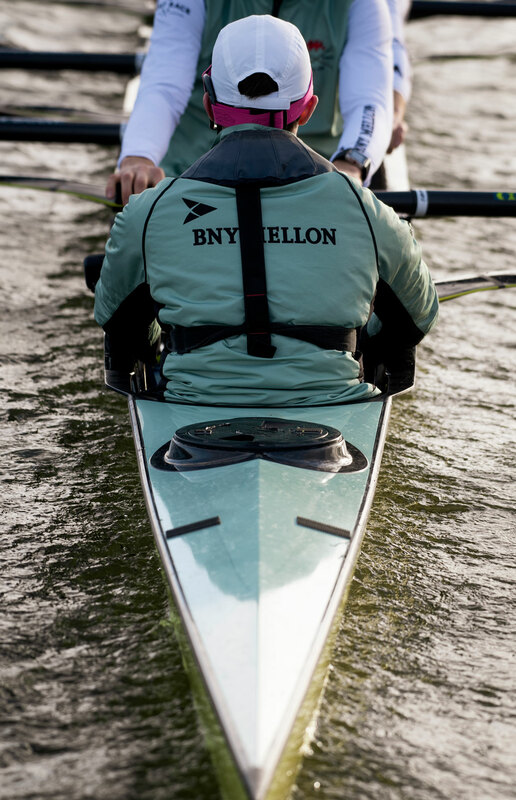 Before the wind turned evil, the morning’s session had been a steady string of unexceptional para-races followed by four thrilling eights heats. Before the tail-wind swung round, we had been treated to the sight of the US women’s eight wallopping the Dutch by a length (and China trouncing Canada in the same heat), while Australia stole the only other finals spot and Britain barged past New Zealand behind them. European champions Roumania, looking tired, trailed in clear water back from the Aussies, signalling that the story of the women’s eights is far from over. Good as those two races were, they were bettered by the men. With two qualifying from each heat, and Roumania’s men copying their women in last place, the second heat yielded a far from yawnworthy German victory. The reigning world champion DeutscheAchter paced along at high energy, necessary as they had to fend off the dangerously close Dutch and Italians, the latter bagging second with a quality finish sprint. But it was the earlier race which had spectators gasping in shock, as the USA and Australia posted what must be two of the fastest times ever, a shade outside the world best with photofinish 5-19.20 and 5-19.25 respectively, and demolishing New Zealand and a beleaguered Britain on the way. Fifth by a mile were Canada, whose eights revival will be dead in the water unless they do something incredibly special in the repechage. 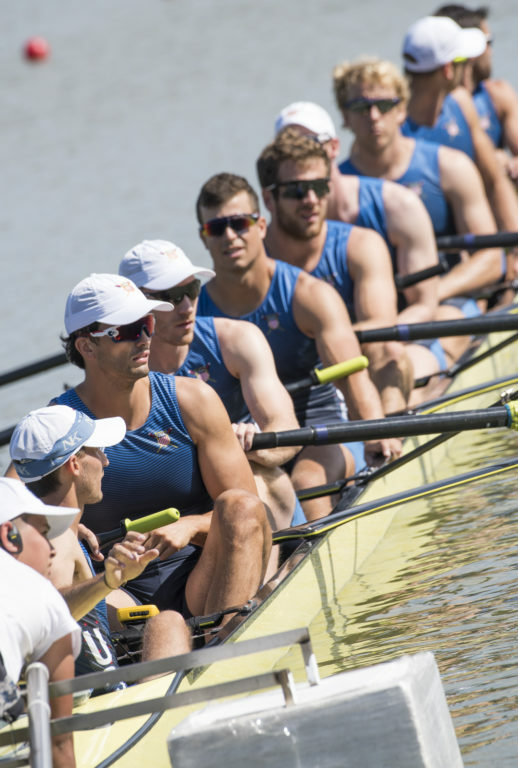 Gird your loins though — that repechage, at sparrowfart on Friday, will be a fight to the death as some of the top world cup eights battle for the last two A-final places. The para-racing went to predictions, with Norway’s Birgit Skarstein by a mile the fastest PR1 W1x in good tail-wind conditions and the PR2 singles races quite spread out. That wasn’t true of all the categories though, and the sight of a near-photofinish in the first PR1 M1x repechage, with Nigeria’s Kingsley Okoroafor beating Argentinian Alejandro Magno Vera by only 0.41 seconds, and getting into the semis in the process, was fantastic. From sublime racing to the inadvertent ridiculous, when the withdrawal of the Italian PR3 W2- left the USA, who had already collected a yellow card for being late to the start, racing solo to the line in their obligatory exhibition. The rescue came courtesy of FISA, who have decided that they will compete in the W2- C-final instead of rowing alone for their medal, which will be a nice first combination of para and non-para crews at this level.